Note: One or all of the batteries can discharge if there is a short circuit in the system. 1. Replace the failing FRU if the power supply problem is caused by a short circuit. 2. Determine if one (or all) of the batteries have become discharged. Replace any discharged battery with its spare, if available. If the Power-On indicator does not turn-on, check the power cord of the AC adapter for correct continuity and installation. 1. If any noise can be heard from AC adapter when it is plugged into ac power outlet, replace AC adapter. If no noise can be heard from AC adapter, go to step 3. 2. If a noise is still heard from new AC adapter, suspect the computer. Replace AC adapter with the original one, then go to the next step. If no noise is heard from new AC adapter, the original AC adapter is defective. 3. Unplug the AC adapter cable from the computer and measure the output voltage at the plug of the AC adapter cable. o If the voltage is not correct, go to the next step. 4. Unplug the AC adapter cable from the ac power outlet and wait for a few minutes. 5. Plug the AC adapter cable into the ac power outlet. 6. Measure the output voltage of the AC adapter. o If the voltage is still not correct, replace the AC adapter. o If voltage is correct, plug AC adapter cable into computer and try the failing operation again. o If the problem goes away, suspect the continuity or installation of the AC adapter cable. o If the problem is not corrected, replace the voltage converter. If the output voltage from the cigarette lighter socket of the car is less than 10.5 V dc, the power-on indicator on the car battery adapter blinks and a noise can be heard continuously. 1. 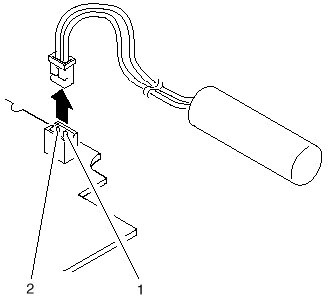 Unplug the car battery adapter cable from the connector, if connected. 2. Plug the car battery adapter into the cigarette lighter socket. Note: If the adapter is already plugged in, be sure to unplug the adapter from the cigarette lighter socket, then plug it back in. 3. Measure the output voltage of the car battery adapter cable. – Try the above test procedures using a different car, if one is available. – Replace car battery adapter if computer works with AC adapter but not car battery adapter. Note: If output voltage from cigarette lighter socket of car is less than 10.5 V dc, the car battery adapter's power-on indicator blinks and a continuous noise is heard. Service the car battery . - Using the system when the battery is removed before plugging in the car adapter and turning the system on. 1. Carefully place the computer bottom-side up. 2. Remove battery pack and measure voltage between battery terminals 1 (+) and 3 (N). o If voltage is less than +10.0 V dc, the battery pack has been discharged or is defective. o If the voltage is more than +10.0 V dc, go to the next step. resistance must be 4 to 30 kilohms. o If the resistance is not correct, replace the battery pack. o If the resistance is correct, go to the next step. 4. Install battery pack and plug AC adapter cable into computer to charge battery pack. replace the battery pack. If the battery is charging normally, the battery is OK.
2. Remove the bottom cover. 3. Disconnect the battery connector from the system board. 4. Measure the voltage of the backup battery. See the following figure. o If voltage is correct, replace system board. o If voltage is not correct, backup battery was discharged by a short circuit or it is defective. The backup battery is a CR2032 with solder tabs. The battery is covered with clear heat shrink tubing. The battery is not sealed airtight as the ends are open (not much). Note: Make sure battery pack is removed from computer before standby battery is removed. 1. Power-off the computer and unplug the AC adapter cable from the computer. 3. Remove the indicator cover. 4. Disconnect the standby battery connector from the voltage converter. 5. Plug the AC adapter cable into the computer and power-on the computer. 6. Measure the output voltage at the connector on the voltage converter. o If the voltage is less than +4 V dc, replace the voltage converter. o If the voltage is more than +4 V dc, go to the next step. 7. Power-off the computer and unplug the AC adapter cable from the computer. 8. Reconnect the standby battery to the voltage converter. 9. Plug AC adapter cable into computer and power-on computer. Allow 30 min for standby battery to charge. 10. Power-off computer and unplug AC adapter cable from computer - remove standby battery. 11. Measure the voltage of standby battery. o If the voltage is less than 3.5 V dc, replace standby battery. If a humming or buzzing sound is heard from the quick charger when it is operating, replace the quick charger. If the charger is operating at a normal quiet sound level, do the following. 1. Perform steps 1 - 3 of Checking the Battery Pack to ensure correct battery pack operation. 2. Connect power cord to quick charger and ac power outlet. Ensure power-on indicator is on. o If power-on indicator does not turn on, check quick charger's power cord for correct continuity and installation. o If the problem is not corrected, replace the quick charger or the power cord. 3. Install the battery pack into the quick charger. o If the charging indicator does not start blinking, replace the quick charger. QUICK CHARGER: The quick charger has two slots to charge two battery packs simultaneously. Charging begins on the first battery pack installed, then after it is completely charged, the other installed battery pack is charged. A REFRESH BUTTON is provided for each battery pack slot to DISCHARGE the battery packs before charging them. There are identifiers and indicators that tell the charging status for each battery pack installed. 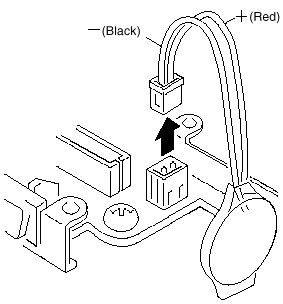 Use this procedure to isolate a problem with the ThinkPad 700, 700C voltage converter. 2. 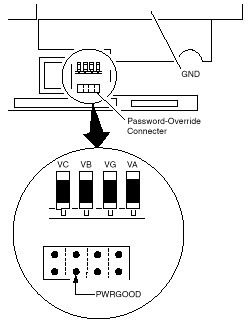 Power-off all attached devices and disconnect them from the computer. 3. Unplug the AC adapter cable and remove the battery pack from the computer. 4. Carefully place the computer bottom-side up and remove the bottom cover. 5. Plug the AC adapter cable into the computer. something under the computer to prevent accidentally actuating the suspend switch. 7. Check the voltages of the voltage converter on the system board. Signal V dc Min. V dc Max. Note: Only VOLT is marked on the system board. Use the above figure to locate the VA, VG, VB, VC, and PWRGOOD signal names. o If all voltages are correct, the voltage converter is operating correctly. o If the voltages are not correct, go to the next step. 8. Power-off the computer and unplug the AC adapter cable from the computer. 9. Check for a short circuit between GND and VA, VG, VB, or VC. o If there is a short circuit, replace the following FRUs one at a time to correct the problem. o If there is no short circuit, go to the next step. 10. Check the output voltage of the AC adapter cable (see Checking the AC Adapter). o If the output voltage is correct, go to the next step. 11. Replace the following FRUs one at a time. 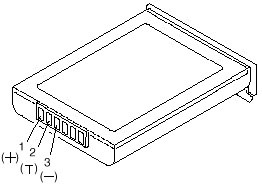 Use this procedure to isolate a problem with the ThinkPad 720, 720C voltage converter. 3. Unplug the AC adapter cable, then remove the battery pack from the computer. 6. Open LCD half-way, stand computer on its front edges so suspend switch isn't activated. 8. Check the voltages of the voltage converter on the system board. See the following figure. VA3, and VB3 signal names. Signal V dc Min V dc Max. o If any voltage is not correct, go to step 9.
o If all voltages are correct, the voltage converter is operating correctly. If the power problem did not reoccur, reconnect the devices removed in step 2 to isolate a device problem. 9. Power-off the computer and unplug the AC adapter cable from the computer. 10. 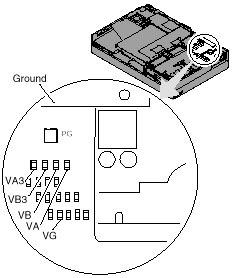 Check for a short circuit between Ground and VA, VG, VB, VA3 or VB3. The following table shows which FRUs can cause a short at each signal. the short circuit disappears. Replace the FRU causing the short circuit. 11. If there is no short circuit, replace the following FRUs one at a time.